These blondies are made with a combination of whole spelt and white spelt flours however you can certainly easily use all of which ever one you prefer. They start with a base of brown butter which is lovely with the whole spelt flour. Then, the batter is packed full of chopped, toasted walnuts and lots of smooth chocolate chips. 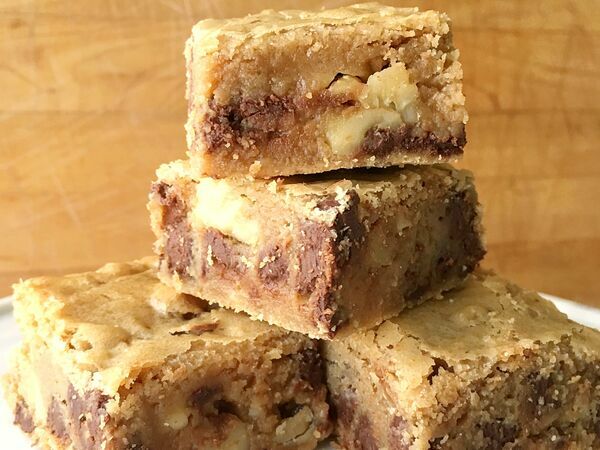 Each bite is full of delicious tastes that are just waiting to delight any blondie or brownie lover!! Preheat oven to 350 degrees and line an 8x8 baking pan with parchment or foil. 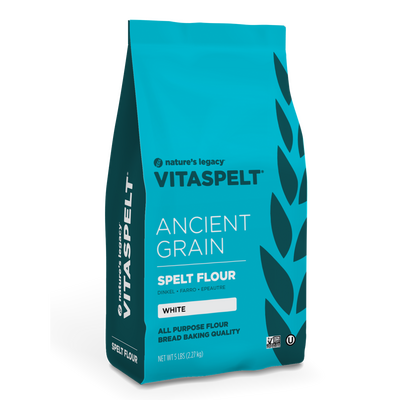 Whisk together the spelt flours with the salt and set aside. In a sauce pan, melt the butter over medium heat. Once it melts, keep a careful eye on it as the butter starts to foam and bubble. Once you start to see little brown bits on the bottom of the pan it is ready. Remove from heat and pour the melted butter into a large glass or metal mixing bowl and set aside to cool. Fold the egg mixture into the cooled, melted butter. Then fold in the flour mixture into the eggs and butter in two batches. Keep folding until the flour is incorporated and no dry pockets of flour remain. Gently fold in the walnuts and chocolate chips until all ingredients are evenly distributed. Scrape batter into prepared pan and spread out evenly. Bake for 30 to 35 minutes. Adjust length if you prefer your blondies a little more under done or a little more well done.